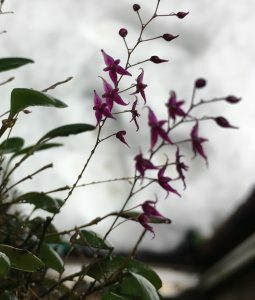 This weekends snow has been a little bit of a challenge but it provides a useful background for tiny dark flowers like these of Lepanthopsis astrophora – one of our smallest orchid species. Lepanthopsis astrophora has leaves less than 1cm long and relatively long spikes of tiny flowers each of which is a perfect purple star (hence the name). 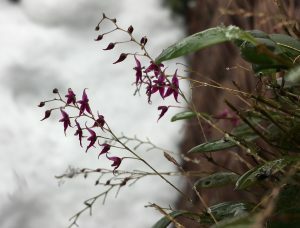 The flowers are long lasting and the species is in flower for most of the year. 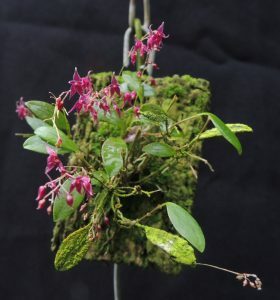 The species is native to cloud forests in Venezuela and we find it succeeds mounted in a shady spot and sprayed daily. It is a good idea to keep a magnifying glass handy so that visitors can wonder at the lovely little flowers.